The return of NFL football kicks into full gear this week and continues with a battle between the New Orleans Saints and Cleveland Browns. Preseason games are a time for teams to find out exactly who will be playing for them, whether it be specialists, rotational guys, or full time starters. Below, PFF’s team of analysts have all the most important position battles and players to watch during today’s game. In a league geared for an aerial assault style passing attack, the Saints are missing perhaps the most important position for a passing offense not named quarterback: left tackle. Injury has sidelined Terron Armstead for now and the team will use the pre-season to determine who bests fits at the spot. Recent reports have shown that Ryan Ramczyk will get first crack at the job but 13-year veteran Khalif Barnes is waiting in the wings. Ramczyk was the team’s first round draft pick of this past draft and brings his second best overall grade among 2017 draft eligible tackles of 85.0 to the table. Ramczyk excelled pass blocking in a defensive driven Big Ten conference last year where he gave up just 12 total pressures and earned the 12th highest pass blocking efficiency among draft-eligible tackles at 97.5. Barnes has graded as “poor” throughout most of his career. In his most recent stretch of significant playing time in 2014, he earned a grade of just 54.1, the 58th highest among tackles. After trading young star receiver Brandin Cooks, the Saints are in need to identify the teams number two receiver as well as replace Cooks’s speed. Ted Ginn is currently ahead of Willie Snead as the team’s No. 2 wide receiver. Ginn was signed this offseason to bring the deep threat ability the could potentially replace Cooks’ production. His 341 receiving yards on balls thrown 20 or more yards ranked 16th in the NFL. His 71.2 overall grade ranked 70th out of 115 qualifying wide receivers. Snead on the other hand offers great production from the slot. His 707 receiving yards from slot ranked fourth among all receivers with at least 32 slot targets and his 1.89 yards per route run from the slot also ranked fourth. Snead graded as the 16th best receiver in football last year with an overall grade of 84.1. Snead has shown ability catching deep passes as well. In 2015 he lead all receivers in catch rate on passes traveling 20 or more yards at 64.3. His 333 deep receiving yards ranked 21st despite only seeing the 46th most targets on deep throws. Newly acquired LB A.J. Klein will look to battle Craig Robertson for the Mike linebacker sport in the Saints base defense. Although both players graded poorly last season Robertson looks like the favorite to take the position currently. Klein played the 2016 season with the Carolina Panthers and finished the season with an overall PFF grade of 42.0 which ranked 74th, Robertson didn’t grade much better with an overall PFF grade of 46.7 ranking 65th last season. Robertson did have a much better run defense grade than Klein, in fact Robertson’s run defense grade of 81.9 ranked 16th among 88 qualifying linebackers in 2016. 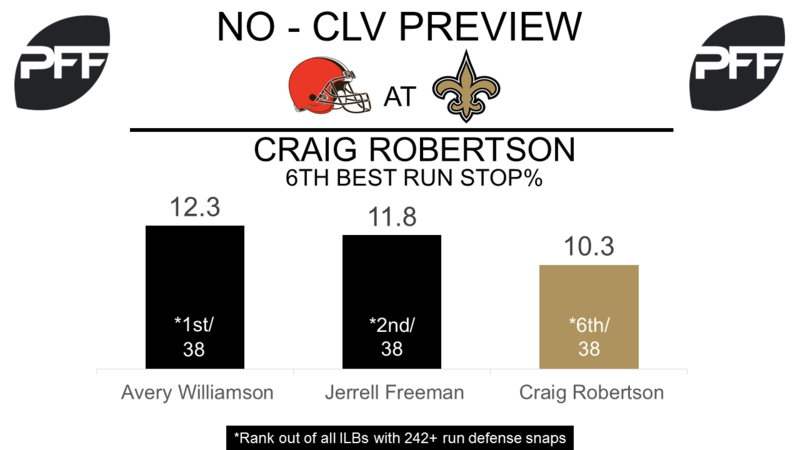 Robertson made 26 stops in run defense on just 252 run snaps for a run stop percentage of 10.3 which ranked 6th among inside linebackers with a minimum of 242 run defense snaps (a stop is anything that constitutes a “win” for the defense). Though head coach Hue Jackson was quick to point out the Browns’ quarterback battle is far from over, Osweiler will get the first crack to run with the first-team offense after being named the starter for Cleveland’s preseason opener. Osweiler’s lone season in Houston was one to forget, as his 48.6 overall grade, ranked above only Jared Goff and Blaine Gabbert among 34 qualifying quarterbacks. Even when kept clean in the pocket, Osweiler was only able to muster an 83.9 passer rating, which ranked 32nd among 34 quarterbacks with at least 200 dropbacks. Kessler has been the presumed frontrunner for most of the offseason after encouraging play in 221 dropbacks last season earned him a 74.7 overall grade. The former USC product was especially cool under pressure, posting a league-best 80.6 adjusted completion percentage when pressured. Kizer was especially adept throwing the deep ball during his time at Notre Dame. On throws traveling 20 yards or more in the air, Kizer posted quarterback ratings of 112.6 and 111.5 in 2015 and 2016 respectively, ranking within the top 15 of Power 5 quarterbacks in both seasons. Michigan’s Swiss army knife entered the league without a natural position at the next level. Peppers is currently listed as a second-team safety on the Browns unofficial depth chart, but his role remains a “work in progress,” according to Tony Grossi of ESPN Cleveland. As a Wolverine, Peppers spent most of his time closer to the line of scrimmage as a linebacker or slot cornerback. 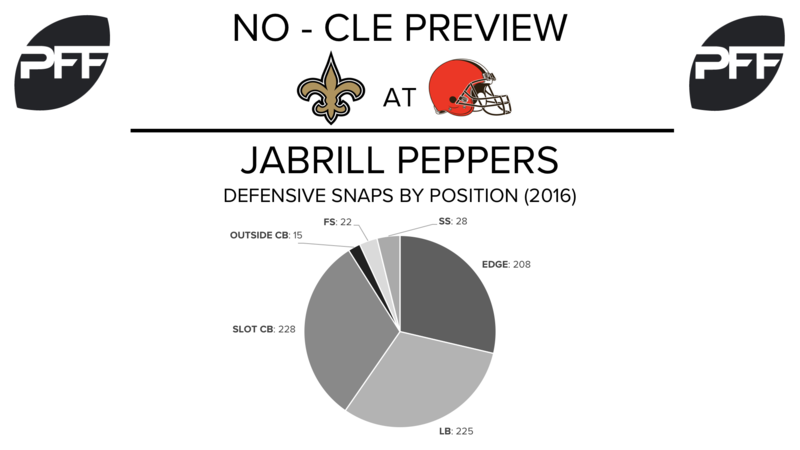 Whether the Browns opt to use him in a similar capacity or play him more as a deep safety — Peppers had only 53 snaps at free safety during his final two seasons in Michigan — will be something to keep an eye on throughout the preseason. Garett’s dominance at Texas A&M made him the No. 1 overall selection in the NFL Draft, and he’s looking to continue that dominance when he steps on an NFL field for the first time in the preseason opener. During his final college season, Garrett showed off the ability to win in any manner as a pass rusher, recording 20 pressures with outside moves, 20 with inside moves and 10 with the bull-rush. Hue Jackson & Co. are hoping for significant development from their young receiver corps this season. Veteran addition Kenny Britt appears to be locked in to the top spot on the Browns depth chart, but after that the Browns will be relying upon a trio of 2016 draft picks at the position. Corey Coleman, Ricardo Louis and Rashard Higgins all earned sub-60.0 overall grades a season, and collectively, Browns quarterbacks posted a 60.1 passer rating when target one of the three rookie wideouts.